The popularity of custom homes has seen an increase in recent years, with twice as many potential homebuyers preferring new homes over existing ones. This is attributed to factors such as the low-maintenance requirements of custom-built homes, energy efficiency, and environmental friendliness. 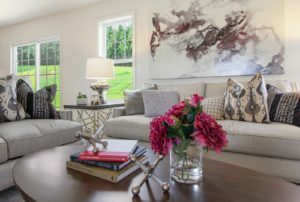 Finding a specialist you trust to help in the endeavor of building your custom home isn’t always easy – but making your new property feel like home can be easier than you think with these tips. Everyone has their favorite kitchen tools and showcasing these items in a unique way can make the visual transition from old kitchen to new a simple one. Suggestions include cook books, a favorite pot, or a set of knives. Having a quality collection of utensils is one of the most important inclusions in any kitchen, and sharp, well-maintained blades increase efficiency by streamlining the cooking process. Sitting down in front of the TV or reading a book on the couch is how most people like to spend their free time… so why not feel as comfortable as possible while doing it? A great way to spruce up your living room is to make use of the windows and blinds or curtains – giving a personal touch that can instantly make your home cozy. Who doesn’t appreciate some well-deserved bathroom relaxation? Taking a nice, long shower or bath is something just about anyone can enjoy. Your bathroom is a great location to place extra lighting. It can make the space feel welcoming, and you can adjust the lighting based on your mood or the time of day. We spend most of our time in our bedroom, one-third to be exact. This room cannot be ignored, and you can augment its coziness by investing in bedspreads, sheets and pillows with relaxing patterns. Air quality is important in any home, especially where you sleep. Adding plants that clean the air in your bedroom can improve sleep. Considering the amount of time spent in our homes, it’s important to make it inviting and relaxing to not just you, but to anyone coming over for a visit. It may seem like an overwhelming and daunting task at first – but taking the time to turn your house into a home is a task you won’t regret taking on.